Johan Pilthammar (left) and industrial supervisor Mats Sigvant (right) at start of presentation. Never before has the car industry been as challenging, interesting, and demanding as it is today. New and advanced techniques are being continuously introduced, which has led to increasing competition in an almost ever-expanding car market. As the pace and complexity heightens in the car market, manufacturing processes must advance at an equal speed. An important manufacturing process within the automotive industry, and the focus of this thesis, is sheet metal forming (SMF). Sheet metal forming is used to create door panels, structural beams, and trunk lids, among other parts, by forming sheets of metal in press lines with stamping dies. The SMF process has been simulated for the past couple of decades with finite element (FE) simulations, whereby one can predict factors such as shape, strains, thickness, springback, risk of failure, and wrinkles. A factor that most SMF simulations do not currently include is the die and press elasticity. This factor is handled manually during the die tryout phase, which is often long and expensive. The importance of accurately representing press and die elasticity in SMF simulations is the focus of this research project. The research objective is to achieve virtual tryout and improved production support through SMF simulations that consider elastic die and press deformations. Loading a die with production forces and including the deformations in SMF simulations achieves a reliable result. It is impossible to achieve accurate simulation results without including the die deformations. This thesis also describes numerical methods for optimizing and compensating tool surfaces against press and die deformations. In order for these compensations to be valid, it is imperative to accurately represent dies and presses. A method of measuring and inverse modeling the elasticity of a press table has been developed and is based on digital image correlation (DIC) measurements and structural optimization with FE software. Optimization, structural analysis, and SMF simulations together with experimental measurements have immense potential to improve simulation results and significantly reduce the lead time of stamping dies. Last but not least, improved production support and die design are other areas that can benefit from these tools. Mats, Sharon, Johan (with one of his children), and Roald after completion of the event. Reviewer and discussion leader was Roald Lingbeek (PhD), who is working at Autoliv B.V & KG in Hamburg, Tyskland. Roald highlighted both strong and weak points with the work and provided some interesting insights and suggestions for the future work. 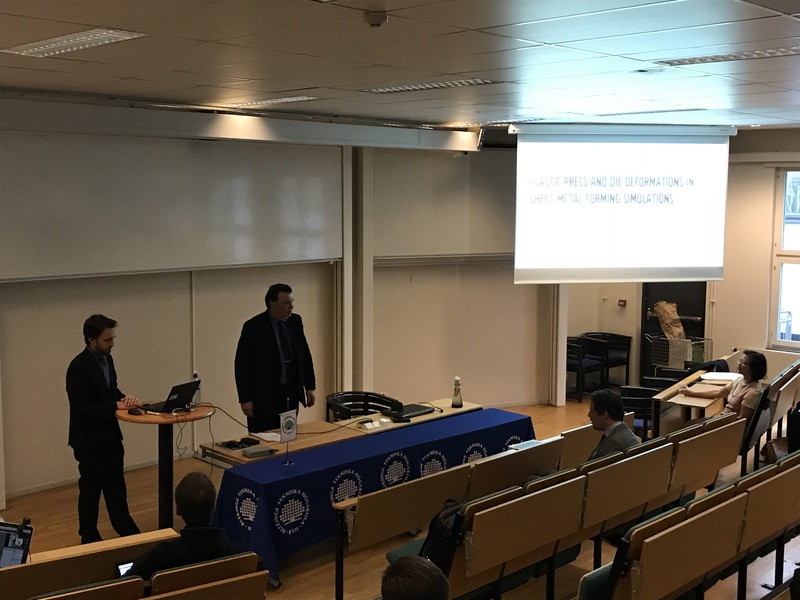 After a thorough review and discussion of Johan’s work, led by Roald, examiner Professor Sharon Kao-Walter delivered the verdict that the licentiate thesis and presentations met the standards and it was a pass! 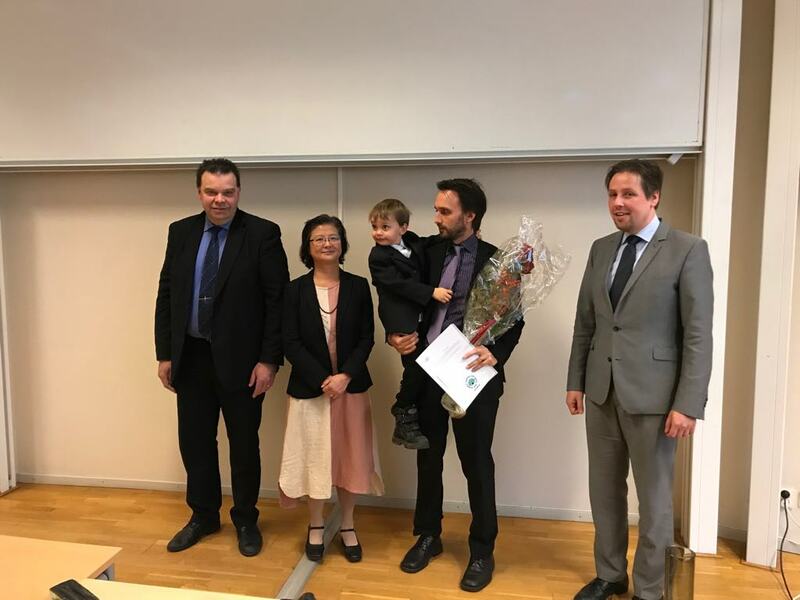 Main supervisor for Johan’s work has been Professor Sharon Kao-Walter and assistant supervisor has beenMats Sigvant, both of the Department of Mechanical Engineering at BTH, and Mats also working at Volvo Cars in Olofström. For more information, contact Johan Pilthammar (johan.pilthammar@bth.se).